Drawn natively in a 24x24 resolution for 1080p displays, GemSet is much more crisp than its 16x16 contemporaries. The entire graphics set uses a bright 32-color palette, so everything will be crystal-clear on even the highest-resolution displays. All profession graphics are color-coded according to their ASCII counterparts and black has been kept as the dominant color of the graphics set. If you want graphics but don't want to sacrifice the aesthetics of ASCII, this is the graphics set for you. Download and unzip a copy of DF 42.04. Download GemSet, copy the contents of GemSet 1.41 into the DF directory and override any conflicting files. Download the latest DFHack release and extract this to the DF folder, overriding conflicting files. If you wish to install GemSet into a vanilla save, repeat step 2 and override the files inside your save folder. 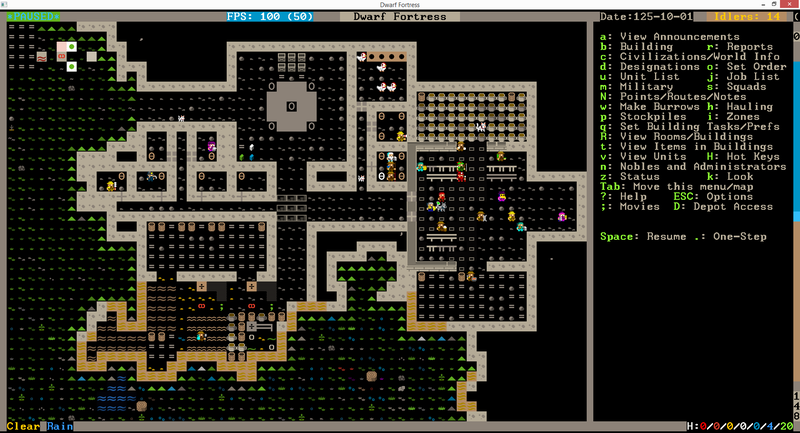 When I first conceived this project, I wanted to make Dwarf Fortress more accessible and bring more people into the community. It's my way of thanking the developers for everything they've done. 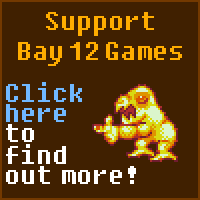 So if you're reading this, please consider supporting Dwarf Fortress by donating to Bay 12 Games. 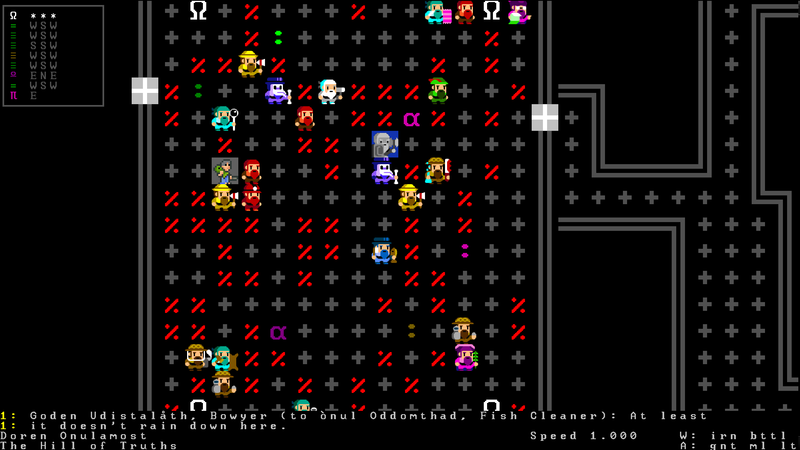 Dwarf Fortress wouldn't have been possible without the incredible dedication of Toady One and ThreeToe. Max™ - Text files for races. 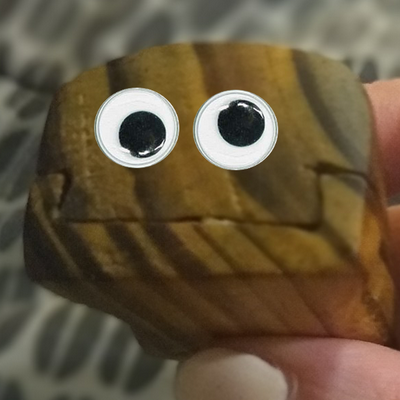 Button - Help with BAMM! GemSet is reserved under a CC-BY-SA-4.0 license. You may redistribute and edit it for any purpose, even commercially. Edit: whoops, was counting from 0 going down and got 15. Ah, you released it. It's been a long while since you send me that sample, I thought you might have disappeared. Will there be a tileset or item sprites for Twbt too? PS: Your animals lack the hunter-trained and war-trained versions. 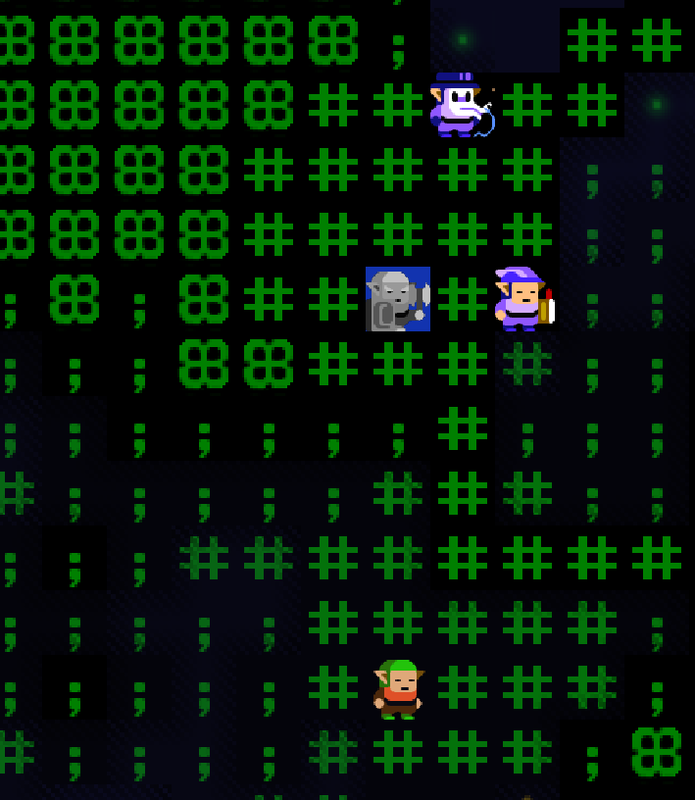 This is with the tiles zoomed in super dooper stupid far, you can see the difference in the human on the left vs the dorfs, the 48x curses set gives me a pink background btw, not sure what happened there. 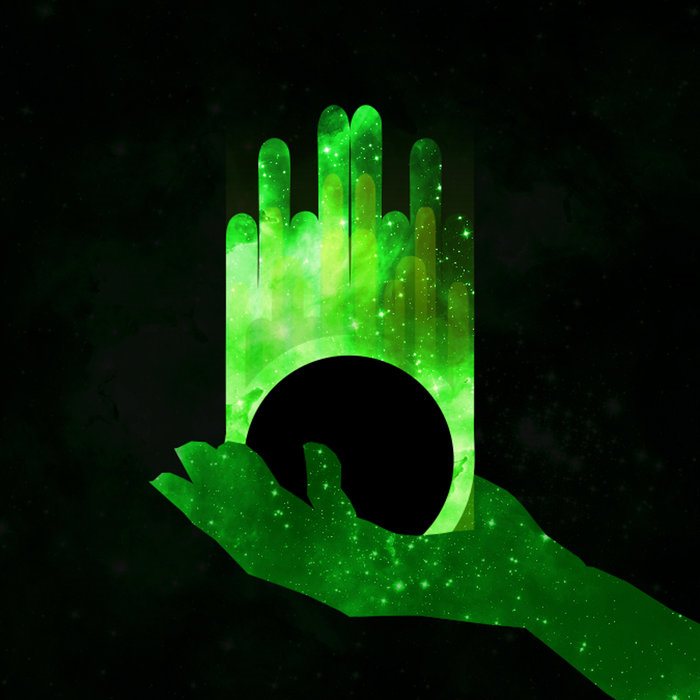 I think this would work very well with either the Jolly Bastion or Spacefox tileset. Oh god I just realized the adventurer shield has the @ on it! Thank you! Five months of work and it was certainly worth it. I'm much happier with the results than DawnFortress. Everything is nice and crisp now so you won't strain your eyes to look at little brown lumps. As for TWBT support...That is planned but I am not sure how to approach it. I'll need to learn how to create TWBT graphics and I'll need an all-inclusive list of every possible thing that can be textured with TWBT. I'm not sure how I'll handle materials, though. From what I've seen, you can create different sprites for different materials or just recolor a grayscale image? And silly me! 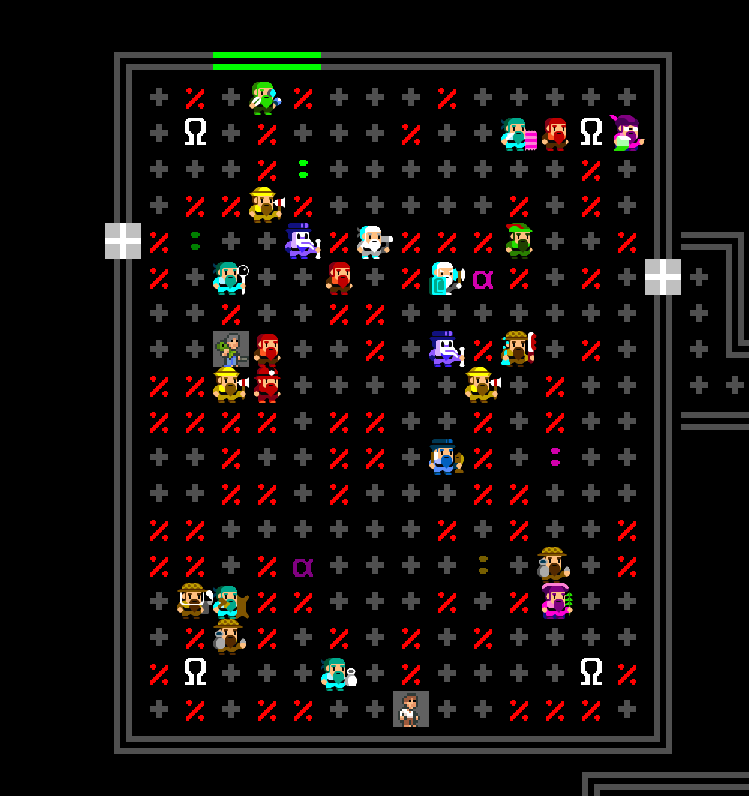 I forgot the TRAINED_WAR and TRAINED_HUNTER varieties. I'm not about to go shove a collar on everything (and I doubt the player would notice the distinction) so I think I'll handle those with icons. What do you think of this idea? Wonderful! Now that all of the exceptions are out of the way (races and equipment) all that's left are the text files for the creatures. Like I stated in the OP, anyone is open to write a script to do this automatically. I did my best to structure my sprite sheets so that machine-generated graphics files would work with them. I've also gone ahead and added your screenshot to the OP. It's a little plain, but it will suffice until I can find more screenshots. 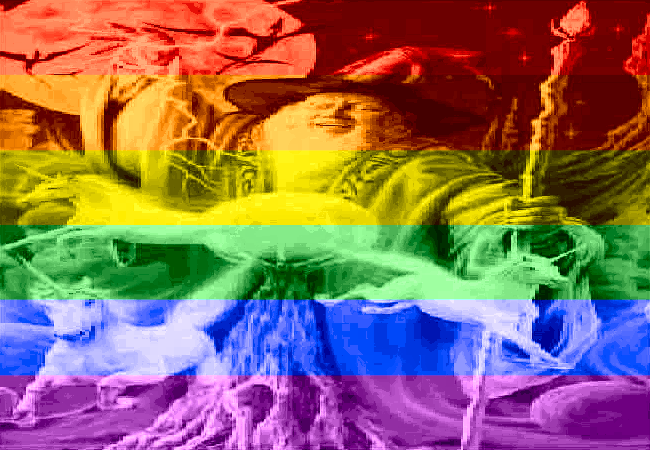 I've gone ahead and fixed the transparency issue on curses_square_48. I tested it myself and everything seems to be fine aside from the broken truetype support. I'm not sure how to make something sift through and do it automatically unfortunately, do love the look of these though. Twbt uses tilesets that are 16 tiles x 16 tiles of any size you want, your 24x and 48x is fine. 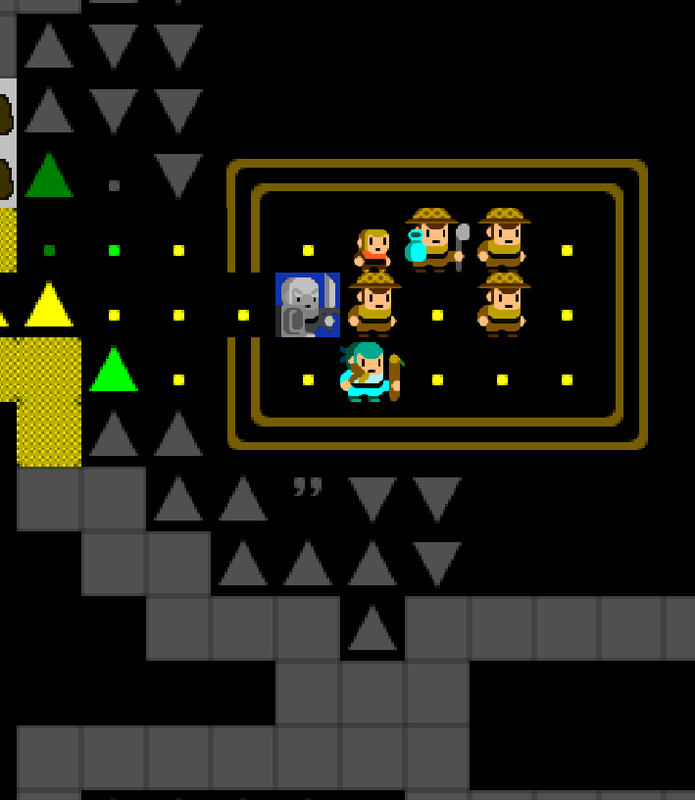 You can create as many tileset as necessary. If you do for example one for weapons and it only has 20 sprites, you can leave the other 236 sprites empty, no problem. 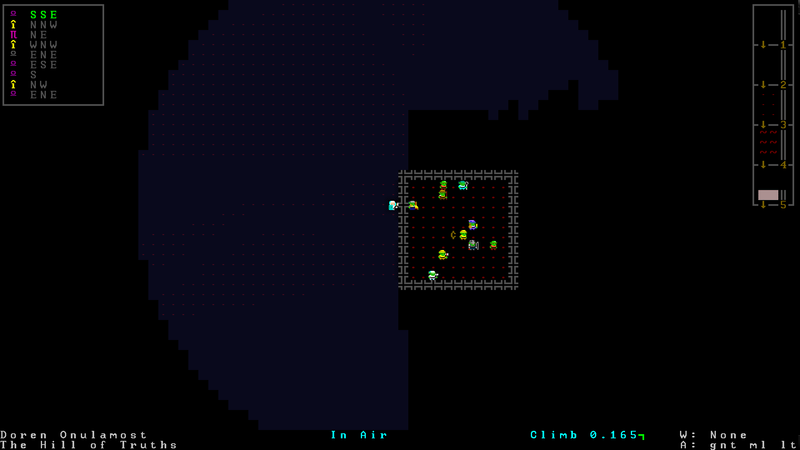 - Using multiple graphics for things that are currently mapped to the same icon, e.g. the X is the letter 'X', it's a floodgate, it's a bin and it's up/down-stairs. You could make 5 sprites for these 5 things and separate it. - Item graphics. You can give individual sprites to any object in item_*.txt files. 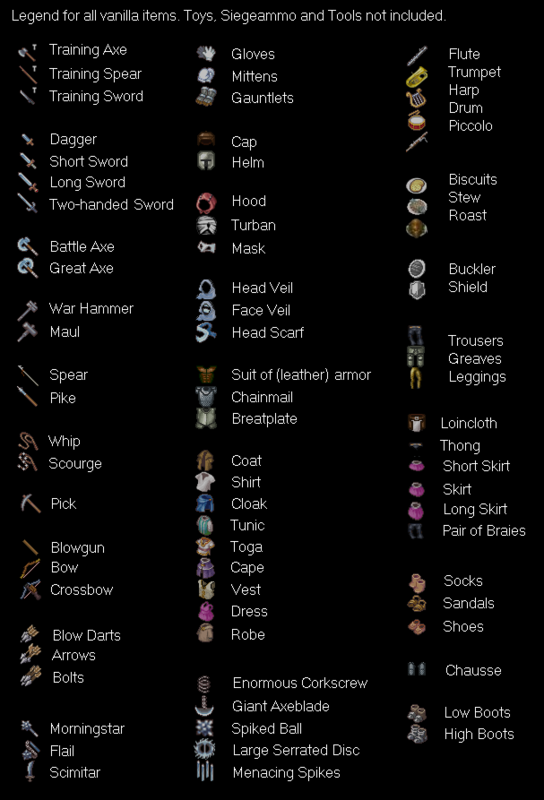 These are weapons, armors, pants, shoes, gloves, helmets, instruments, toys, tools, ammo, siege_ammo, shields and food. - Workshop graphics. Instead of using tile-based lego-like puzzle workshops, you can paint one large image. Instead of merging 9 24x tiles, you can paint one workshop as 64x64 image and import it. This is especially nice considering that the vanilla furnaces (smelter, glass furnace, kiln, wood furnace) look exactly the same. Twbt uses the ingame colors for items, just like a tileset would. It's more or less grayscale and it apply colors ingame automatically. I agree on the icons idea, but instead of hearts (oh, he has a heart, he must have full health) I would have gone for a sword(maybe +shield) and a crossbow (maybe +quiver). After all soldiers usually carry melee weapons, while hunters carry crossbows. Text files added for all creatures. Alpha transparency fixed on curses_square_24.png and curses_square_48.png. Alpha transparency fixed on 48px graphics. Thanks, Meph! TWBT is pretty huge so I'm glad you could explain it to me a bit more. I'm a bit confused on some things, though. 1. Where would I find the subtypes for overrides? 2. Is the ID for defining a [TILESET:] optional? If you don't define it, does the game just slot your tileset into the next number? In your case, 2? 3. Is there any way to quickly test in-game if you have overwritten everything properly? 4. Can you link me an example of overriding a building as one giant image?